Showing Off Some Hillbilly Love! Charles Joseph Faudree was born 17 Sept 1870 to Richard Bollen Faudree and his wife, Virginia Wright. He was one of five known children to this couple. 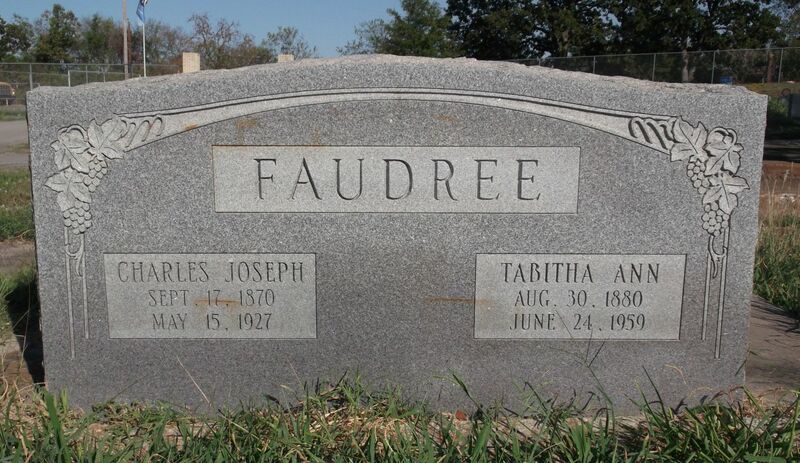 Charles married Tabitha Ann Duke [I have no information on her family]. She was born 30 Aug 1880. At present I have no further information on this couple, but hope to do some research on this line soon. Charles died 15 May 1927. And Tabitha lived until 24 June 1959. 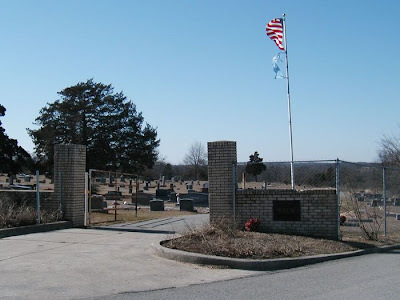 The couple is buried here, Westview Cemetery, Atoka, Atoka County, Oklahoma. Monroe - in the State of Virginia. Place of Marriage, At Elijah Wickline's Esq - Monroe Co. Va.
Age of Wife, 25 "
Place of Wife's Birth, Monroe " "
Place of Wife's Residence, " " "
Thanks to Randy over at GeneaMusings for yet another great challenge! It's Saturday Night, so it's time for some Genealogy Fun. Many of us have traced our patrilineal line and had a Y-DNA test done for the line. I thought that some of you might be interested in tracing another Y-DNA line - that of your maternal grandfather. 1) What was your mother's father's name? 2) What is your mother's father's patrilineal line? That is, his father's father's father's ... back to the most distant male ancestor in that line? 3) Can you identify male sibling(s) of your mother's father, and any living male descendants from those male sibling(s)? If so, you have a candidate to do a Y-DNA test on that patrilineal line. If not, you may have to find male siblings, and their descendants, of the next generation back, or even further. 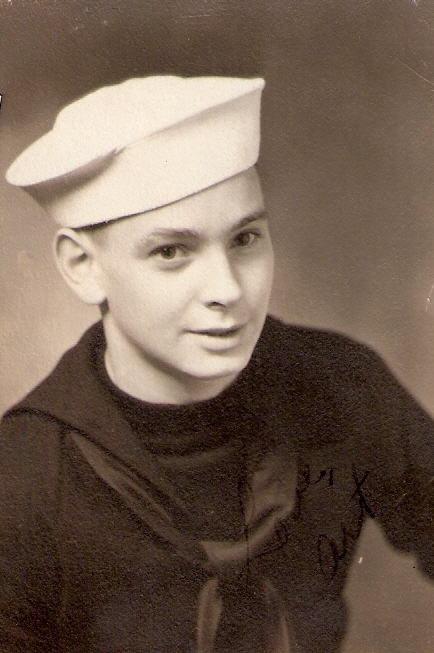 1) My mother's father's name was Henry Condar Dreher, Jr. It would appear that James Walter and Robert Royce Dreher would be the only candidates for this study. 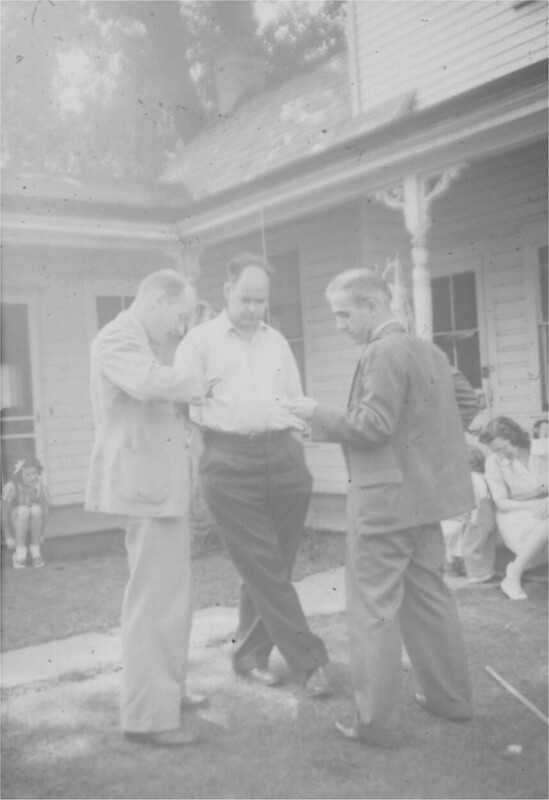 However, in looking for these individuals today, I find that James Walter Dreher [b. 14 Jun 1933] passed away on 05 May 2008. I could find no record for Robert Royce Dreher passing, and assume at this point he is still alive. And there is, in fact, an active telephone listing for him. This would mean that he would be our most likely candidate for this study. This is an avenue I am interested in pursuing, but at present lack the funds for the study. Perhaps this is something I can save for! Would you like to do a Y-DNA study on your maternal patrilineal line? If so, can you answer the above questions regarding your ancestors and their descendants? If funds were unavailable for this study, what creative ways can you think of to raise the cost of the study? John Monroe Bean was born on 15 Dec 1866 in Cincinatti, Ohio. He died on 10 Apr 1954 in Waiteville, Monroe Co., WV. He was the son of 8. William McHarvey BEAN and 9. Margaret Smith PERKINS. He married Mary Elizabeth Faudree on 01 Dec 1935 in Covington, Alleghany, Virginia. Mary Elizabeth Faudree was born 03 Jun 1897 in Centennial, Monroe County, West Virginia. She was the daughter of Stephen Ledford Faudree and Elizabeth Carnifix. 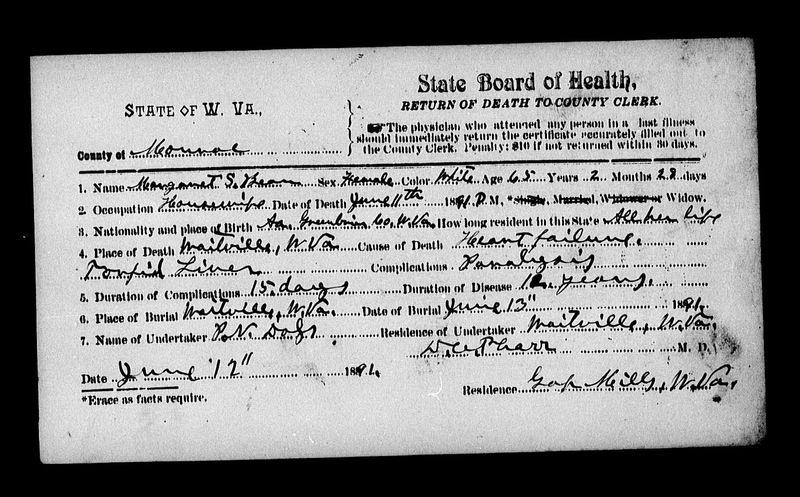 William McHarvey Bean was born on 26 Aug 1832 in Dropping Lick, Near Zenith, Monroe Co, VA. He died on 14 May 1890 in Gap Mills, Monroe Co, WV. He was the son of 16. William M. BEAN and17. Rachel WISEMAN. He married Margaret Smith PERKINS on 26 Aug 1852 in Monroe County, Virginia. Margaret Smith Perkins was born 03 Mar 1826 in Greenbrier County, Virginia. She died 11 Jun 1891 in Monroe County, West Virginia. She was the daughter of 18. Samuel PERKINS and 19.Elizabeth TUCKWILLER. Elizabeth Tuckwiller was born 08 Nov 1779 in Greenbrier County, Virginia. She died 28 Jul 1867 in Greenbrier County, Virginia. She was the daughter of 38. John TUCKWILLER and 39. Catherine RIFFE. Greenbrier, Virginia. He was the son of 36. James PERKINS and 37. Elizabeth BONDERANT. 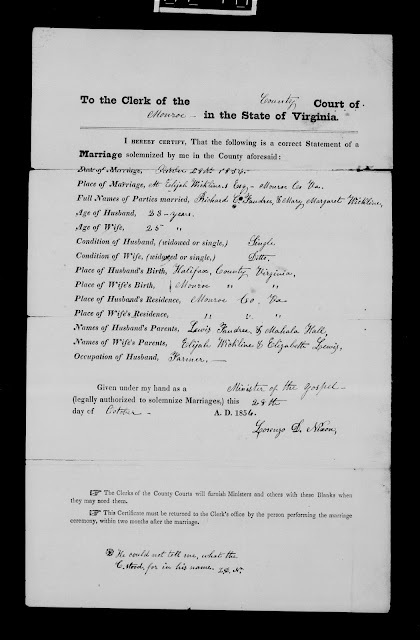 He married Elizabeth TUCKWILLER on 15 Sep 1812 in Greenbrier County, Virginia. Catherine Riffe was born 1762 in Pennsylvania. She died 01 Sep 1823 in Rich Hollow, Greenbrier County, Virginia. She was the daughter of 78. Jacob RIFFE and 79. Catherine UNKNOWN. John Tuckwiller was born in 1752 in Virginia. He died on 18 Feb 1832 in Rich Hollow, Greenbrier County, Virginia. He was the son of 76. Thomas TUCKWILLER and 77. Sabina UNKNOWN. He married Catherine RIFFE about 1777. Jacob Riffe was born in 1722. He died in 1790 in Greenbrier County, Virginia. He was the son of 156. John Jacob RIFFE and 157. Unknown. He married Catherine UNKNOWN. John Jacob Riffe He died about 1756 in Lancaster County, Pennsylvania. He married Unknown. 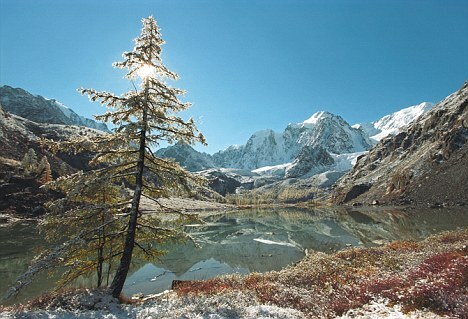 Altai in southern Siberia sits right at the centre of Russia. But the tiny, mountainous republic has a claim to fame unknown until now - Native Americans can trace their origins to the remote region. DNA research revealed that genetic markers linking people living in the Russian republic of Altai, southern Siberia, with indigenous populations in North America. A study of the mutations indicated a lineage shift between 13,000 and 14,000 years ago - when people are thought to have walked across the ice from Russia to America. 'Altai is a key area because it's a place where people have been coming and going for thousands and thousands of years,' said Dr Theodore Schurr, from the University of Pennsylvania in the US. Roughly 20-25,000 years ago, these prehistoric humans carried their Asian genetic lineages up into the far reaches of Siberia and eventually across the then-exposed Bering land mass into the Americas. 'Our goal in working in this area was to better define what those founding lineages or sister lineages are to Native American populations,' Schurr said. **Read this article via here. Mama cooked a lot of pinto beans while I was growing up. We ate them at least once a week. And sometimes twice a week. They were cheap. Wholesome. And nutritious. We never complained! 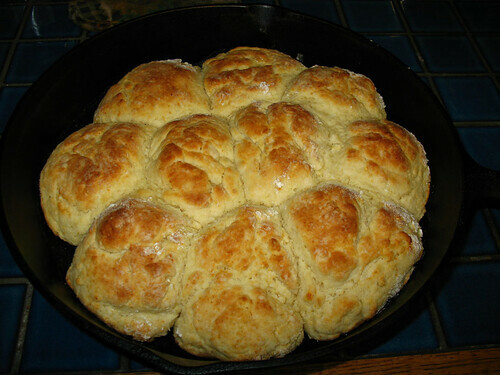 We had them most often simply with cornbread. But more often than not, she'd add a big skillet full of fried potatoes and onions for the side dish. Sometimes Mama would add a chunk of ham, or bone, to flavor the beans. And sometimes, when money was tight, it was simply a bouillion cube! But pinto beans were always a tasty dinner in our home, that was completely welcomed. What most folks never knew, was that when the beans were dished up and placed in a big bowl on our dining table, a goodly portion had already been removed from the pot before hand and consumed. The culprit? Mama simply could never get through a pot of beans cooking without "stealing a few". You've got to understand... these weren't beans that were opened from a can and simply heated up! No sirree! These were beans that had been bought in a bag, dry. They were culled over for bad beans and stones. They were rinsed. Soaked overnight. Drained and rinsed again. And finally set on the stove on a low setting and watched closely, from about 4 a.m. [Mama's early morning work! ], until dinner time around 6 in the evening! The scent of these beans cooking all day wafted into every nook and cranny of the house! There wasn't a corner you could run to that the scent had not permeated. In 1995 Mama suffered a brain aneurysm, and no longer is able to cook for herself. So, I thought I'd never get to see anyone stealing bean sandwiches again. But in 1998, I married a "good ol' boy" from south-Texas, and guess what he does when I'm cooking pinto beans??? You got it! He likes to sneak in, about mid-afternoon, open up my crock-pot and using a slotted spoon, he makes himself a bean sandwich. Funny how things seem to come full circle, isn't it? Even more funny? I most often join him in making a pinto bean sandwich! 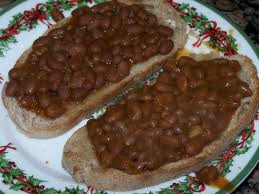 Have you ever eaten a pinto bean sandwich? If not, would you try one? How many people born in 1790 have living grandchildren today? Not great-grandchildren, but second generation descendants? You can read the details in an article by Eric Pfeiffer in Yahoo News at http://goo.gl/uJdsr. Many, many years, when I was a little girl of only 5, my Grandma Bean removed a ring from her pinky finger, and placed it on my ring finger. She told me she wanted me to have the ring. The ring is a tiny [size 4 I think!] pinky ring with silver band and scrolled setting. The stone, jade. 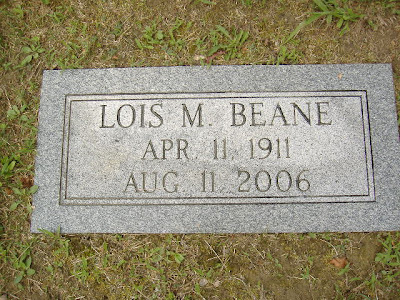 Grandma Beane was born on 03 Jun 1897 in Monroe County, West Virginia. The tiny hamlet of Centennial, which is no longer present, but lies between Gap Mills and Sweet Springs, on US Route 3, was her home. She was born to Stephen Ledford Faudree and his wife, Elizabeth Carnifix. She was the eighth born of ten children to the couple. For years Mary sat with the elderly, performed housekeeping for pay, and even worked with the deaf and mute. Her education was limited, but she was taught much within the home, and could read and write quite well. In 1935, she met John Monroe Bean, Sr. He was a widower, twice over. And he was the father of 12 children. The eldest was a year older than Mary, and the youngest had been living with an Aunt since his birth, six years earlier. On 01 Dec 1935 at the M.E. 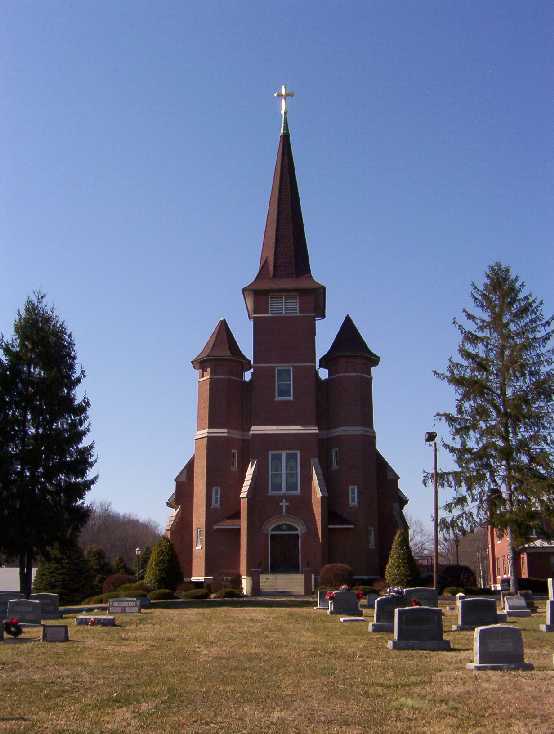 Church in Covington, Alleghany County, Virginia, John and Mary were wed. They set up a home in Waiteville of Monroe County, where John had resided most of his life. By now, Mary was 38. And John was quite a bit her elder, at 69. In 1937, Mary, now 40, had her first child, my father, Walter. 20 months later, shortly before her 42nd birthday, she had another son, Edsel. And four years later, her youngest son, Roy Edwin. By the time of the last child's birth, Mary was 46, and John was 77 years old. In 1946 Roy Edwin died from a ruptured appendix at the tender age of 3. And in 1954, John died. He was a little over 87 years of age. In 1964, Mary moved from her home in West Virginia, to join our family in Norfolk, Virginia. It was then that she gave me this ring. For the next 10-1/2 years she was there for the laughter, tears, and joys of a young girl's growing up. She was even there for the growing pains of the loss of first love. She left us to join her ancestors on 01 January 1975. The little ring is worn completely through in the back of the band. I wore it continuously until I gained weight as an adult and could wear it no longer. It now resides in a favorite old jewelry box, where my mementos hide until I can bear to look at them on occasion. [I don't know about others, but I become so melancholy when I look over these treasures of mine!] Each time I pull it out, I am reminded of the scent of vanilla as Grandma baked custard, or the crispy bite of chicken she had me "help" her fry. The baby powder she used on the canvas of her sneakers to keep them clean. The "White Shoulders" 'parfum' she dabbed behind her ears. The tissue she kept inside the hem of her sleeve. The dainty fringe of hair she had, all curled tightly. Her oddly gray eyes. And her smile. Grandma never spoke an unkind or harsh word in my presence. As a matter of fact, she told me more than once... "If you can't say something nice about someone, then don't say anything at all." And I loved her, "It's better to be thought a fool, than open your mouth and be proven to be one!" And she gave the absolute best hugs in the whole wide world. When Grandma passed away, I was fifteen years old. I can remember the day she was buried was so cold, and the ground frozen so hard that they had to dynamite the grave open in order to bury her. As we stood on the hillside, and the minister said the final words at her graveside, I totally lost control. I collapsed in the arms of a dear old family friend, Albert Wiseman. Mr. Wiseman was a wonderful, grandfatherly man, and attended church with us. As a matter of fact, he was our Sunday School Superintendent. He and his wife, Elsie, wrapped their arms, and their coats about me. The three of us, literally tucked inside one another's coats on that windy day. Mr. Wiseman reached out a gnarled hand and wiped away the tears running down my cheeks with his handkerchief. "Cyndi, Grandmother wouldn't want you to cry, you know. She's having the best reunion she's ever had right now!" Recently, when another genealogy researcher lost her mother, she posted on Facebook that her mother had joined her ancestors that morning. It was then I was reminded of Mr. Wiseman's words back in January of 1975. While I plan to live for many, many years yet, I am so looking forward to that day, when I can step through the garden gates, and be met by my own ancestors for a family reunion! Until then, I will occasionally pull out the little mementos and gather up the memories and call those dear family members near. Do you have a family item that calls to mind your ancestors? If so, did you personally know that ancestor? What special memories do you have of them? Lois Brown Beane surrounded by daughters, Argylee Maleta, Duffie June, Sharon Lynn, Loretta Gayle, and the youngest, Billie Jacqueline. Lois Maleta Brown was born to Charles Andrew Brown and his wife Virgie Blanche Thompson in Princeton, Mercer County, West Virginia. 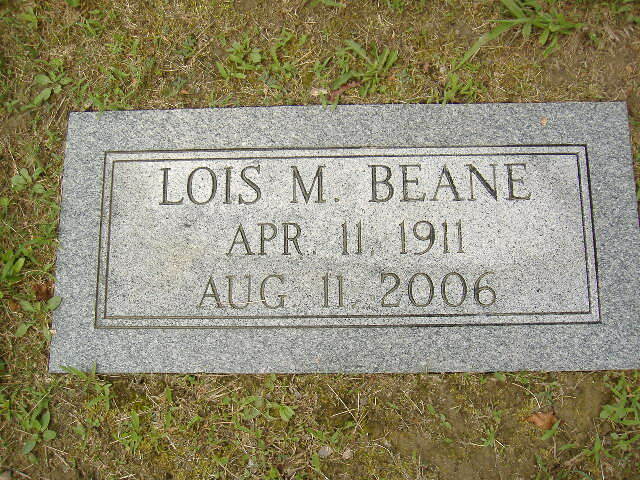 She married Lama Wellington Beane [1899-1957] on 09 Oct 1927 in Wyoming County, West Virginia. Lois died in Marion, NC. She is buried at Sunset Memorial Park in Beckley, Raleigh County, West Virginia. I was excited to receive this packet of 4 Twist and Bind report covers and binding kits. And I was not disappointed. Each report kit can handle up to about 40 pages. However, 40-sheets of the pre-punched paper is all that is included in the kit. I'd like to see enough paper enclosed to allow four 40-page reports! However, the kit will allow for four 10-page reports. 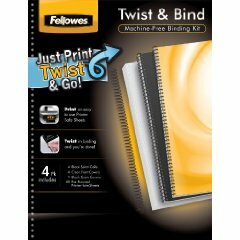 The really fantastic part of these report kits is that it allows you to attach a spiral binding without use of a complicated, or expensive, spiral binding machine! A few minutes and your report is spiral bound! Simply insert the special, pre-punched paper into your favorite printer, and prepare your report. Place a front and back report cover over your paper, and then slowly twist the binder into place. While not for large, or bulky, prints, this is a perfect report cover for smaller print jobs. ****DISCLOSURE: This product was provided by Amazon Vine for an independent and non-biased review. This shows Lama Wellington Beane died on 29 Dec 1957 in Oceana, Wyoming County, West Virginia. A Male, white, and married, he was born on 28 Apr 1899, and was 58 years of age at the time of his death. 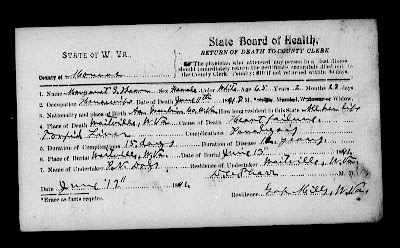 His father is listed as John Bean and his mother as Blanch Crozier, with his birthplace listed as Waiteville, WV. The cause of death is listed as Carcinoma of lungs with disseminated metastases [lung cancer that has spread throughout the body]. 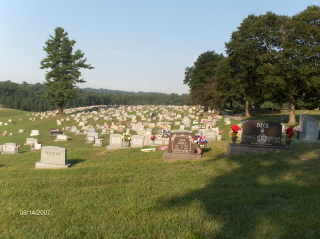 Lama was buried on 01 Jan 1958 at Sunset Memorial Gardens in Beckley, WV. Lama was my Uncle. His wife, Lois, is also buried at Sunset Memorial Park. 1. Go to The Random Name Generator and click the red “Generate Name” button at the top of the screen (more than once if you want). Pick one of the names you see. 5. 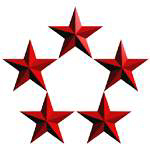 Post about it on your own blog, or as a comment here, or a comment on Facebook, Google Plus or Twitter. I always love these random searches, Randy! Yeah, that was it! Denis Hopper! Heading on over to Ancestry.com, I went with the first Denis Hopper found on a random census. It was the 1900 Census for Grayson County, Texas. Here I found [Roll: T623_1640, line 97, p 22B/ ED 103] little Denis. He was listed as being born in Jun 1895 , and was 4 years old at the time. His father was listed as William [a Farmer] and his mother as Ellen. His father is listed as being born in Missouri, with his parents both born in Tennessee. 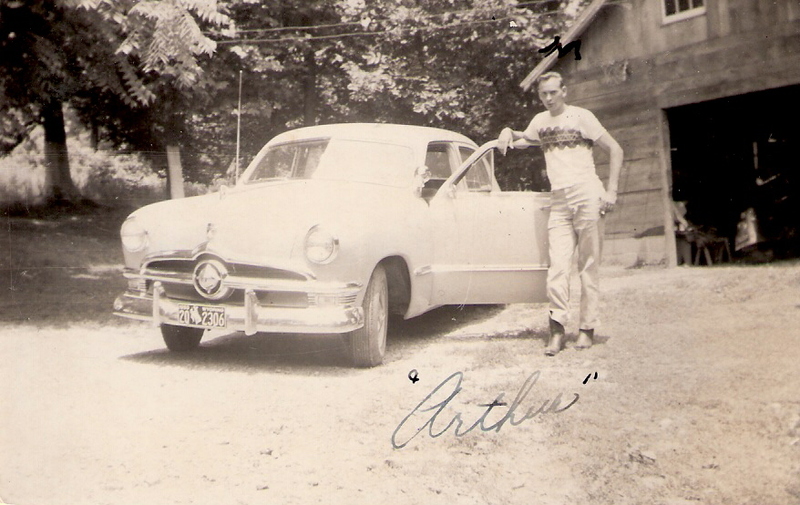 His mother as being born in Tennessee and her father born in Missouri and mother in Tennessee. The next time I found Denis, he is now listed as Dennis Martin Hopper, he is listed on the WWI Draft Records. This gave us his complete birthdate as 23 Jan 1895, and he is listed as being born in Tom Bean, Grayson County, Texas. He is currently living in Sherman, Grayson, Texas, and is employed as a carpenter; married with 2 children. This does give us somewhat of a physical description: Tall, Slender, Blue Eyes and Blond Hair. By 1920 he is still in Sherman, Grayson, TX and is found living at 904 Maxey Street. His wife's name is found here, Ruth E. She is listed as 24 years of age [the same as he is listed] and was born in Texas. However in the 1920 Census Denis' parents are listed as being born in Kentucky. And Ruth's father in KY and her mother in MO. By now the couple have a pair twin girls. In this Census they are listed as Florene and Lorene, both 5 years of age and born Texas. Remaining on Ancestry.com we find that Denis and his family can be tracked as to their residence through the City Directories. From 1914 - 1935 they lived in Sherman. And from 1946 until 1955 in Denison, Grayson, Texas. In 1942, Denis listed in the WWII Draft Cards found on Family Search. He is listed as 47 years of age and married. He is employed by Joe Smith, also in Sherman. Heading back over to Ancestry.com we note that Denis is listed one last time on the Texas Death Index, 1903-2000. Denis died on 15 October 1963 in Grayson County. Wed Ruth E. Pennington, Sept 20, 1912 Sherman, Grayson County, Texas"
With this info in hand, I then headed back to FindAGrave and although I did not find Dennis listed here, I did find his wife, Ruth Elizabeth Pennington Hopper, [Find A Grave Memorial# 53620115]. However, it listed her spouse as George A. Hopper. From the cradle to the grave, Dennis Martin Hopper lived to the ripe old age of 68 years. He was a carpenter/ cabinet maker by trade, and lived his entire life in Grayson County, Texas. Thanks Randy, for another great challenge! I got this recipe from a real cowboy, many years ago while living in Texas. By the time I met the old gentleman, he was broken down and getting rather long in the tooth from so many years out on the range. But a nicer, more gentlemanly man I have never met. He taught me all about reading "cowboy books". Yep, he introduced me to Louis L'Amour, Zane Gray, among just a few. And I, as an 18-year old, introduced him to romance novels. A more unlikely pair there never was. But he was kind to me, at a time when I needed it. Cowboy cooks used to mix these up and put them in cast iron Dutch ovens over the hot coals of a campfire. Melt shortening in 10-inch cast iron skillet over low heat. Meanwhile, in a medium mixing bowl, whisk together all dry ingredients. Mix in milk and stir together [I use a fork for this]. When shortening is completely melted, carefully swirl around interior of skillet to be sure bottom and sides are thoroughly coated. Pour melted shortening into dough, and stir to incorporate. Once the shortening is stirred in, use your hand and gently knead dough in the bowl to mix wel. Only knead a few times, kneading very much will make this dense and rubbery. Place dough in skillet and pat down and spread over entire bottom of skillet. Place pan in oven and bake approximately 10-12 minutes. 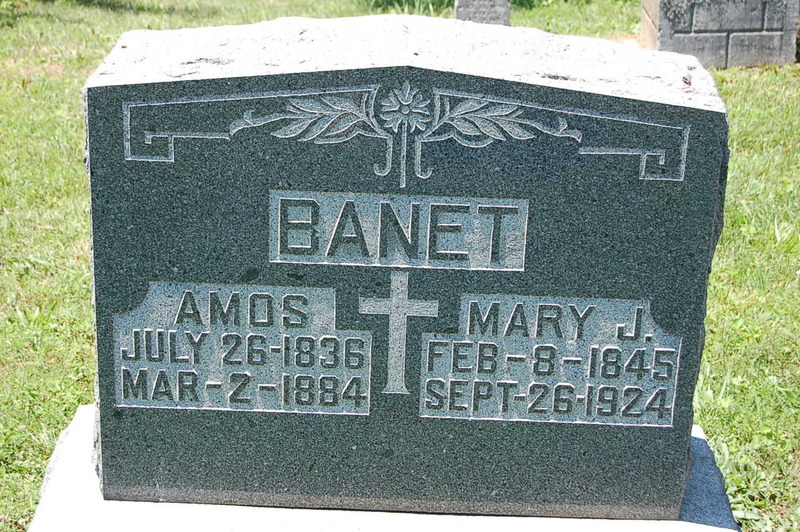 Amos Banet was born 26 Jul 1836 to Ettiene Banet and Francois Bidaine Banet, in Floyds Knobs, Floyd County, Indiana. He was the 8th-born of 12 children. Ettiene and Francois and their first 7 children having been born in France, Amos was the first born in the United States. Birth records list him as "Aimee Appolinaire". He married Mary Jane Knable, born 8 Feb 1845, on 26 May 1863. The couple went on to have two known children, Frances and Adolph. 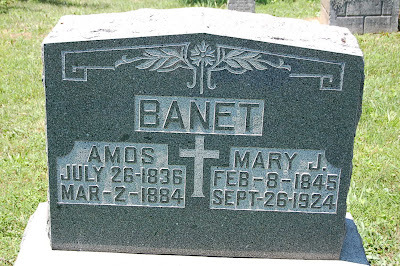 Amos [Aimee] died 02 Mar 1884, and is buried at St. Mary of the Knobs, Floyds Knobs, Floyd County, Indiana. Mary lived until 26 Sep 1924. She is buried beside him. Amos is my 2nd great-grand-uncle. I cannot bear to part with any of them, thinking that perhaps one day I will find the identity of these individuals. And so, for the next few weeks, I will be posting some of this collection on Sentimental Sunday's. I can't thin of a more appropriate title! 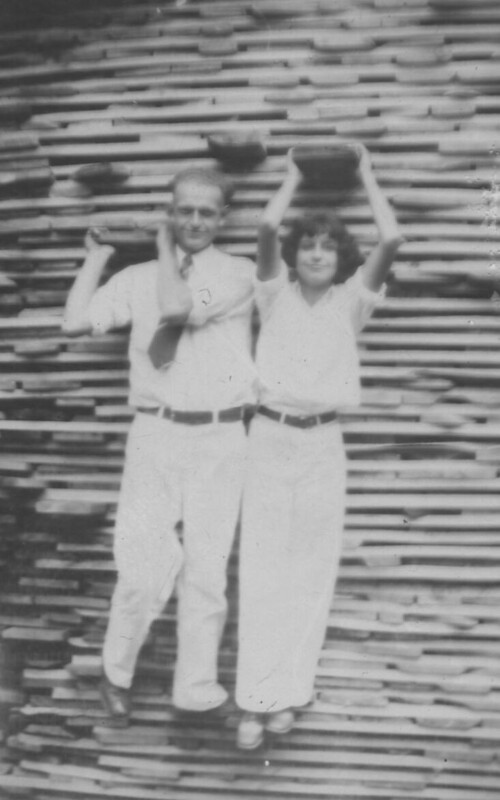 This unidentified man and woman are balancing on the very narrow ends of a stack of lumber. 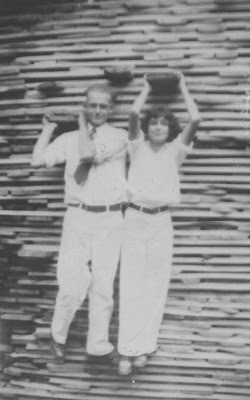 A stack this high, one considers the possibilities that the photograph might have been taken in a lumber yard. Because of their dress, it is hard to say the date this was taken. I am going to make a guess at between 1930-1940. The photo is from a collection my Uncle had. He passed away in 1972. He lived in West Virginia his entire life. The photo may have been taken there. And the young man pictured may actually b my uncle, but no one is willing to say for sure as "Well, it kinda looks like him, but then I'm not sure, so don't say it is him!". Do you have any orphan photographs from your family? 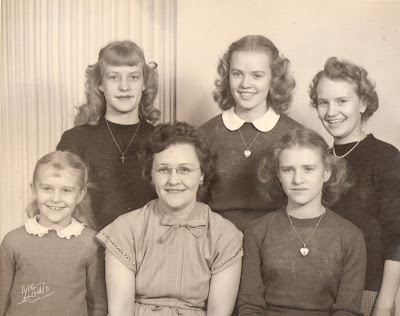 It's Saturday Night - is everyone ready for some Genealogy Fun? 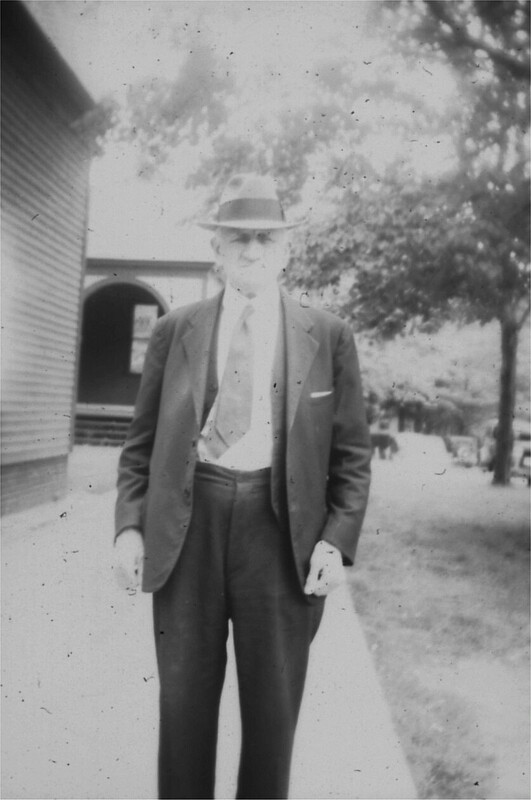 I decided to highlight my great-grandfather, Henry C. Dreher, Sr. 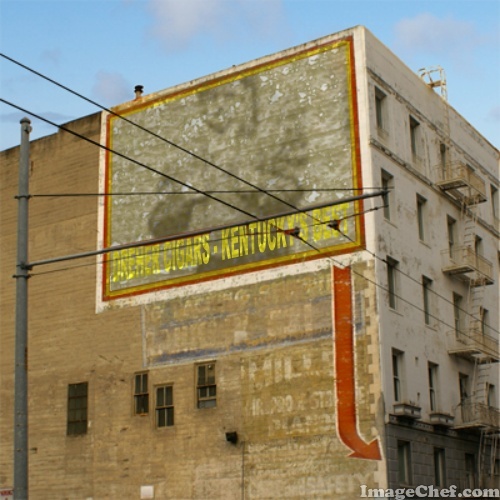 He was a cigar roller in Louisville, Kentucky at the turn of the 20th century. I fictionalized the company, giving it his name, but love it! 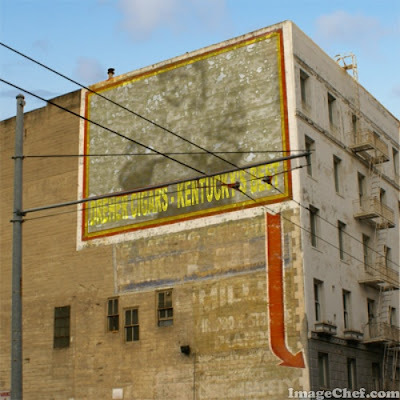 "Dreher Cigars - Kentucky's Best"
Henry C. Dreher, Sr. was a first-generation American born German-American. His parents were born "in the old country". He was born 1863 and died 1925, and lived his whole life in Louisville, KY. This line pursues my husband's matrilineal ancestry. Joseph Wright HENRY was born on 20 Sep 1927 in Fulton County, KY. He died on 16 Nov 1993 in Batesville, Panola, Mississippi. He was the son of 4. William Lee HENRY and 5. Emma Louise PETTIE. He married Betty Louise Rotge on 30 Jul 1947. Betty Louise Rotge was born 30 Aug 1930 in Kerrville, Kerr, Texas. She died 05 Jul 2003 in Jourdanton, Atascosa, Texas. She was the daughter of 6. John Cornelius ROTGE and 7. Ora Lee Sparks. John Cornelius ROTGE was born on 16 Jan 1910. He died on 09 Jun 1983 in Kerrville, Kerr, Texas. He was the son of 12. Peter ROTGE and 13. Lillie Mae Surber. He married Ora Lee Sparks in 1930. Ora Lee Sparks was born 26 Oct 1914 in Bandera, Edwards, Texas. She died Aug 1982 in San Antonio, Bexar, Texas. She was the daughter of 14. William Jacob Sparks and 15. Laura May Clements. Peter ROTGE was born on 25 Jun 1872 in New Orleans, Louisiana. He died on 15 Jul 1956 in San Antonio, Bexar, Texas. He was the son of 24. Jean Rotge and 25. Anna Annette Martin. He married Lillie Mae Surber on 15 Nov 1902. Lillie Mae Surber was born 29 Jan 1881 in Texas. She died 26 Sep 1932. She was the daughter of 26. John W. SURBER and 27. Visa Ann SURBER. Jean Rotge was born on 24 Dec 1829 in Paris, France. He died on 06 Jul 1887 in Goliad, Texas. He married Anna Annette Martin. Anna Annette Martin was born 15 Sep 1839 in Paris, France. She died 25 Sep 1917 in Goliad, Texas. She was the daughter of 50. Antoine MARTIN and 51. Louise GUEDON.